I had a great time hunting the Arizona mountains for America's rarest quail. This year, some parts of the high, grassy country got 20" of rain! Perfect for the grass the Mearns needs. 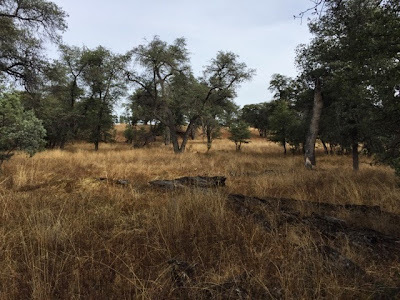 The grassy, savanna the bird requires, spotted with oaks, is very reminiscent of Spain. 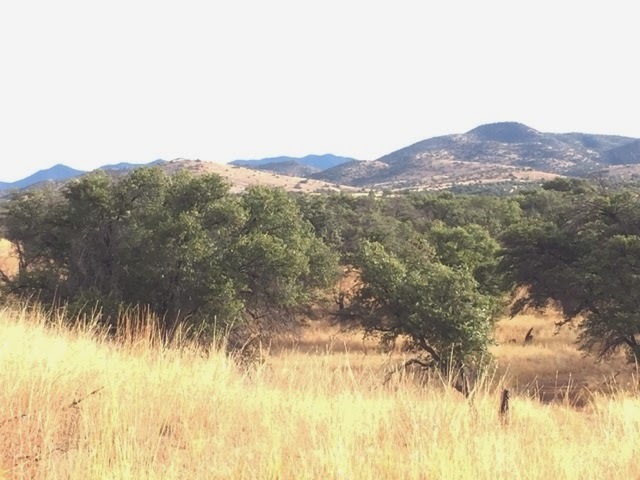 It's beautiful country and not what I would expect of Arizona. These birds hold tight- real tight! They are perfect for young dogs. My two puppies each had several covey points. The birds politely held until I arrived and, after the flush, they flew straight line and didn't go far, at all. With cool weather, the singles would be easy to pick up. My friend Wally and his fine, young Brit, Spirit. My puppy, Shack, and the day's take. Vince got a true double with his 28 ga.! I met Vince, who hunts over pointing Labs. He let me tag along on an afternoon cast. 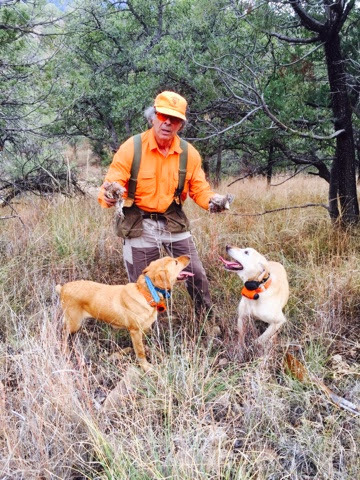 His dogs, Fargo and Bullet, worked close and found 5 coveys for us in the warmth of the afternoon. 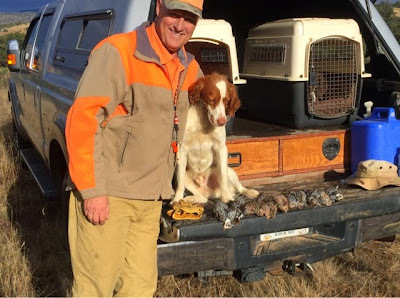 It's not my cup of tea, but they are fine bird dogs and the results are just as good as the traditional pointing dogs. 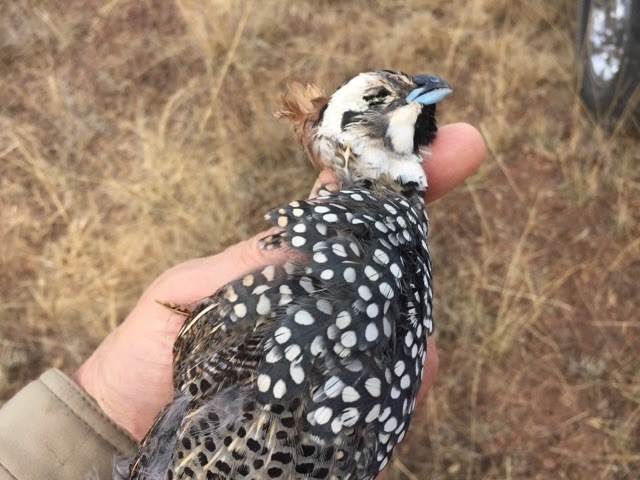 Over all, I'm honored to have been able to hunt this fine bird with these folks. I hunted with a retired Air Force fighter pilot, a retired attorney and s retired collegiate All/American and NFL football player. None were under 70. It was a pleasure. 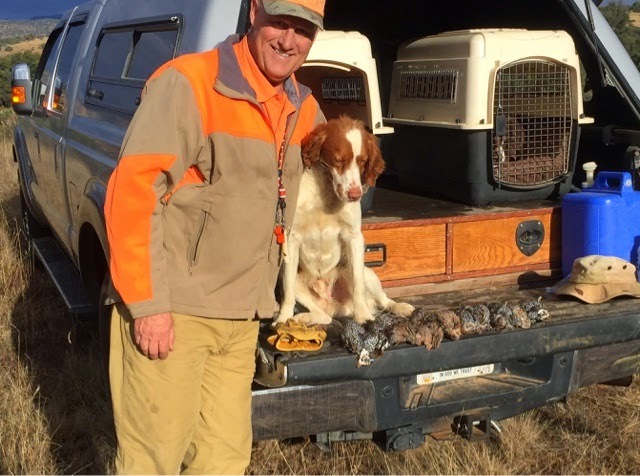 Mearns hunters are a special breed of bird hunter, a little like the dedicated Chukar hunter. 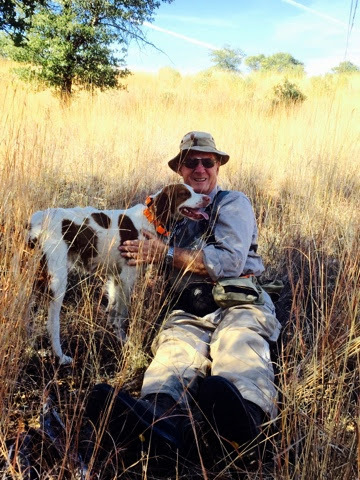 It was good to meet a few of them and see their excellent bird dogs in action. It gives me a picture of my future.